Coal gasification: worth the trade-off? The U.S. Senate is expected to vote today on the federal energy bill. The bill would provide money to help build a new power plant in northern Minnesota. The plant would convert coal into gas to make electricity. Burning gas is much cleaner than burning coal. But critics say the Iron Range isn't the best place to use the technology. Coal is subjected to heat, pressure, and steam. 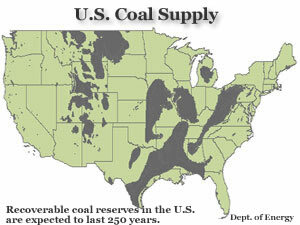 The coal breaks down into gases, mainly hydrogen, and some carbon monoxide. Those gases are burned to generate electricity. Also, the waste heat is used to boil water and make steam. And that steam can produce more electricity. Coal gasification plants are a lot cleaner than standard coal power plants. They put out much less of the sulfur and nitrogen compounds that make smog and acid rain. Tom Micheletti owns Excelsior Energy, the company that wants to build the coal gasification plant on the Iron Range. He says the plant will also do a very good job of removing mercury. "We believe on the order of at least 90 percent," Micheletti says. "It's an extremely clean way of producing electricity." Micheletti says the plant will also produce chemicals that can be used by other industries. And it will produce hydrogen. That's what some people hope will soon be powering our cars and trucks. But the project has its critics. Environmentalists worry about another coal gasification byproduct -- carbon dioxide. Carbon dioxide builds up in the atmosphere and contributes to global climate change. All power plants put out carbon dioxide. But in coal gasification plants, the CO2 is concentrated, so it can be captured and kept out of the environment. We've skipped some very important steps and given this developer a free pass. John Thompson is with the Clean Air Task Force, a national environmental group. He says one of the best things about coal gasification is its potential to capture the greenhouse gas. He says a plant in North Dakota pipes its carbon dioxide to an oil field in Canada. "The CO2 is pushed underground," says Thompson. "It moves the oil to the well. And it stays in that formation deep underground, and is prevented from being released to the atmosphere." But there are no oil fields in northern Minnesota. And the geology on the Iron Range doesn't have layers that could store the gas. Environmentalists are suspicious of the project. They say the state and federal governments are giving it too much help. The Minnesota Legislature gave the project power of eminent domain. That means the company can force landowners to sell their land for transmission lines. Normally only government agencies and regulated utilities can do that. The Legislature also offered the project a shortcut. The company doesn't have to go through public hearings to prove the power plant is needed. That's a concern for the Izaak Walton League's Bill Grant. "Because we've skipped the step of identifying whether there's a need for this project, we really haven't established that there is a public purpose," Grant says. "We've skipped some very important steps and given this developer a free pass." The federal government is offering help, too. The federal energy bill includes hundreds of millions in loan guarantees to help build the project. John Thompson, from the Clean Air Task Force, says that's a bad idea. He wants to develop coal gasification technology. But he worries if the Iron Range plant doesn't work well, it'll give the whole field a black eye. He says if the plant had to go through the usual review process, it would be more likely to succeed. "When you say it's going to be this particular plant because your legislator from Minnesota has the clout to put it in, it begs the question, if this was open to all bids, would better locations or better technologies be used?" says Thompson. But the project's backers say it will succeed. Tom Micheletti says it'll bring nothing but good to Minnesota. "Why wouldn't we want to create more jobs in northeastern Minnesota?" he asks. "Why wouldn't we want to produce cleaner electricity? Why shouldn't we be the innovators?" Micheletti says he could start construction in 2005. Meanwhile, environmental groups will ask lawmakers to roll back some of the privileges included in last year's legislation.